I just had a moment of 'how do you spell boathook, does it have a hyphen' and googled it. And was disconcerted to see lots of photos of boathooks with nice safe round blobs on the end of the fending-off spike and the hook. I just wrote a story in which someone wields a boathook as a weapon (hence the belated doubtful googling) and so this disconcerted me. I had a clear idea of the sort of boathook I meant, which is the sort that my Dad owned, which was an object you could quite easily kill someone with, possibly by accident. I had to google some more to discover that I wasn't misremembering the configuration of old boathooks. I remember it as basically a spear with a barb. If you were ever shipwrecked and had nothing to eat except for the sharks you spear with your boathook and pull up onto the raft made out of a few half-empty barrels of rum (you'd know what the spike is for. You stick it in the eye, with a quick in and out and a twist to hook the gills. Or of course you can use it to push away on stone walls, but that'd be boring. Something about this comment seems terrifyingly knowledgable bout the matter of shark-spearing with a boathook! About boat-hooks I know nothing, sorry. But older things did tend to be a lot more potentially dangerous than their modern equivalents. Traditional coconut graters for instance, which are basically a footrest with a ferocious barbed wheel attached, set so that the spikes are either in the horizontal plane or upward (unfortunately I could not find a picture of that particular terrifying style) is far scarier than the genteel modern version. And actually pirates were/are a concern in a lot of waters, including inland ones, in a lot of places (though perhaps not the UK), so it could well have been a defensive weapon too, originally. Eeek! You'd be lucky to retain all your fingers! I am reminded of my grandparents Sausage Making Thing, which was similarly loaded with spikey bits. I tried using a mandoline once. In the absence of a handy surgeon standing by to reattach my fingers, I am never going to do so again. A very sharp knife is so much safer. I've never encountered either sort of boathook, but was so taken with the jaunty nautical woman I had to find out something about her. 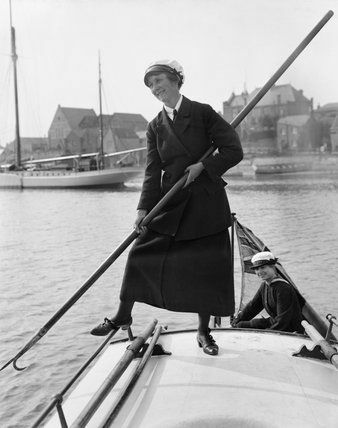 She's "Gladys Wilburn of the Womens Royal Naval Service (WRNS) using a boat-hook to push her motor boat, the BALMACAAN, away from the shore at Southwick harbour, 1918." She looks a match for a pirate. I should have credited the photo really, I was distracted by only looking at the style of boothook. She certainly does look intrepid, though one feels that long skirt would be a little cumbersome. The hook is for pulling things towards you. It has to be sharp(ish) so you can hook it round ropes easily. The point is for pushing things away from you. It has to be sharp so it can find a place to lodge firmly on the thing you're pushing, and doesn't just slide across it. Bobbles on the end are for reassuring people who don't understand that tools are perfectly safe when used by competent people, but assume that as they'd probably accidentally stab someone, so would everyone else (because they don't appreciate that other people are more competent than they are). Well, we never did drown, I suppose. I know nothing of boathooks. So unwise am I in the ways of boathooks that this post has filled me instead with thoughts of the following kind. A terrifying, shaking boa reported by someone with a lisp? Someone sending a rapid text to report that although they have met a boa, they're actually ok? The website address of Little Bo Peep, who has set up business at a place called Hook? This trend to do away with hyphens often leads to trains of thought of this kind. This is a very compelling argument in favour of the hyphen, which almost, though not quite, overrules my years of horrifying experience trying to spell URL's over the telephone in the 1990s and then doing the 'the hyphen is the little bar thing. It might be up next to the zero key? Oh, OK, the zero is next to the 9' thing.